CHAPTER XXXVII AUGMENTATIONS OF HONOUR OF all heraldic distinctions the possession of an augmentation of honour is the one most prized. The Sovereign is of course the fountain of honour, and though ordinary grants of arms are made by Letters Patent under the hands and seals of the Kings of Arms, by virtue of the powers expressly and specifically conferred upon them in the Letters Patent respectively appointing them to their offices, a grant of arms is theoretically a grant from the Crown. The privilege of the possession of arms in the ordinary event is left in the discretion of the Earl Marshal, whose warrant is a condition precedent to the issue of a Grant. Providing a person is palpably living in that style and condition of life in which the use of arms is usual, subject always to the Earl Marshal's pleasure and discretion, a Grant of Arms can ordinarily be obtained upon payment of the usual fees. The social status of present-day grantees of arms is considerably in advance of the status of grantees in the Tudor period. An augmentation of arms, however, is on a totally and entirely different footing. It is an especial mark of favour from the Sovereign, and the effective grant is a Royal Warrant under the hand and Privy Seal of the Sovereign. The warrant recites and requires that the augmentation granted shall be exemplified and recorded in the College of Arms. Augmentations have been less frequently conferred in recent years than was formerly the case. Technically speaking, a gift of arms by the Sovereign direct where none previously existed is not an augmentation, though one is naturally inclined to include such grants in the category. Such an example is met with in the shield granted to Colonel Carlos by King Charles to commemorate their mutual adventures in the oak tree (" Or, issuing from a mount in base vert, an oak tree proper, over all on a fess gules, three Imperial crowns also proper ") (Plate II.). There are many gorgeous legends relating to augmentations and arms which are said to have been granted by William the Conqueror as rewards after the Battle of Hastings. Personally I do not believe in a single one. There was a certain augmentation borne by the Dodge family, which, if it be correct, dates from the thirty-fourth year of Edward I., but whether this be authentic it is impossible to say. Most people consider the alleged deed of grant a forgery, and if this be so, the arms only exist by right of subsequent record and the question of augmentation rests upon tradition. The curious charge of the woman's breast distilling drops of milk to typify the nourishment afforded to the king's army is at any rate most interesting (Plate VI.). The earliest undoubted one in this country that I am aware of dates from the reign of Edward III. Sir John de Pelham shared in the glory of the Battle of Poictiers, and in the capture of the French King John. To commemorate this he was granted two round buckles with thongs. The Pelham family arms were "Azure, three pelicans argent," and, as will be seen, these family arms were quartered with the buckles and thongs on a field gules as an augmentation. The quarterly coat forms a part of the arms both of Lord Chichester and of Lord Yarborough at the present day, and "the Pelham buckle" has been the badge of the Pelham family for centuries. The Battle of Flodden was won by the Earl of Surrey, afterwards the Duke of Norfolk, and amongst the many rewards which the King showered upon his successful Marshal was the augmentation to his arms of "a demi-lion pierced in the mouth with an arrow, depicted on the colours for the arms of the Kingdom of Scotland, which the said James, late King of Scots, bore." According to the Act of Parliament under which it was granted this augmentation would seem now to belong exclusively to Lord Mowbray and Stourton and Hon. Mary Petre, but it is borne apparently with official sanction, or more likely perhaps by official inadvertence, by the Duke of Norfolk and the rest of the Howard family. There is actual foundation in fact for these lines. For in a writ couched in very stringent and severe terms issued by the same king in after years decreeing penalties for the improper assumption and use of false arms, specific exception is made in favour of those "who bore arms with us at the Battle of Agincourt." Evidently this formed a very extensive kind of augmentation. The reign of Queen Elizabeth furnishes an interesting example of the gift of a complete coat in the case of Sir Francis Drake, who had been using the arms of another family of the same name. 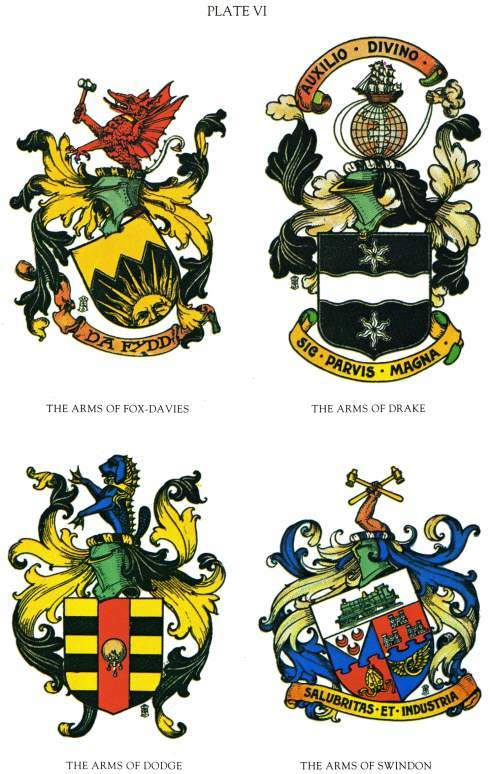 The representative of that family complained to the Queen that Sir Francis, whom he styled an upstart, should take such liberties with his arms; whereupon the Queen said she would give Sir Francis arms which should outrival those of his namesake. At least, such is the legend, and though the arms themselves were granted by Clarenceux King of Arms, and I have not yet found any Royal Warrant indicating that the grant was made by specific Royal command, it is possible the story is correct. The arms are: "Sable, a fess wavy between two stars argent. Crest: a ship under reef, drawn round a terrestrial globe with a cable by a hand issuing from clouds all proper" (Plate VI.). The stars upon the shield are the two pole stars, and the wavy band between them typifies Drake's voyage round the world, as does also the peculiar crest in which the Divine hand is shown guiding his ship around the globe. At the Battle of Naseby Dr. Edward Lake fought bravely for the King, and in the service of his Majesty received no less than sixteen wounds. At the end of the battle, when his left arm was useless, he put the bridle of his horse between his teeth and still fought on. The quartering of augmentation given to him was: "Gules, a dexter arm embowed in armour holding in the hand a sword erect all proper, thereto affixed a banner argent charged with a cross between sixteen escutcheons of the field, on the cross a lion of England." The sixteen shields upon the banner typify his sixteen wounds. After the Commonwealth was established in England, Charles II. made a desperate effort to regain his crown, an effort which culminated in his disastrous defeat at the Battle of Worcester. The King escaped through the gate of the city solely through the heroic efforts of Colonel Newman, and this is kept in remembrance by the inescutcheon of augmentation, viz. : "Gules, a portcullis imperially crowned or." Every one has heard how the King was accompanied in his wanderings by Colonel Carlos, who hid with him in the oak tree at Boscobel. Afterwards the king accompanied Mistress Jane Lane on horseback as her servant to the coast, whence he fled to the Continent. The reward of Colonel Carlos was the gift of the entire coat of arms already referred to. The Lanes, though not until after some years had passed and the King had come back to his own again, were granted two remarkable additions to their family arms. First of all "the canton of England" (that is, the arms of England upon a canton) was added to their shield. They are the only family to whom such an honour has been given, and a most curious result has happened. When the use of armorial bearings was taxed by Act of Parliament the Royal Arms were specially exempted, and on account of this canton the Lane family claimed and obtained exemption from the tax. A few years later a crest was granted to them, namely, a strawberry-roan horse, "couped at the flanks," holding in its feet the Royal crown (Plate II.). It was upon a horse of this colour that the King and Mistress Lane had escaped and thereby saved the crown. Mr. Francis Wolfe, of Madeley, who also was a party to the escape, received the grant of an inescutcheon gules charged with a lion of England. Another family which bears an augmentation to commemorate King Charles' escape is Whitgreave. The reign of Queen Anne produced in the Duke of Marlborough one of the finest generals the world has ever seen; and in the Battle of Blenheim one of its greatest victories. The augmentation which commemorates this is a shield bearing the cross of St. George and in the centre a smaller shield with the golden lilies of France. In the year 1797 the Battle of Camperdown was fought, when Admiral Duncan defeated the Dutch Fleet and was created Lord Camperdown. To his family arms were added a naval crown and a representation of the gold medal given by George III. to Lord Camperdown to commemorate his victory. The arms of Nelson are most interesting, inasmuch as one version of the arms carries two separate and distinct augmentations. It is not, however, the coat as it was granted to and borne by the great Admiral himself. After the Battle of the Nile he received the augmentation on the chief, a landscape showing the palm-tree, the disabled ship, and the battery in ruins. The one crest was the plume of triumph given to the Admiral by the Sultan Selim III., and his second crest, which, however, is not a crest of augmentation, was the stern of the Spanish ship San Josef. After his death at the Battle of Trafalgar his brother was created Earl Nelson, and a second augmentation, namely, a fess wavy sable with the word "Trafalgar" upon it in gold letters, was added to the arms. This, however, has since been discontinued, except by Lord Bridport, who quarters it, whilst the Nelson family has reverted to the arms as they were borne by the great Admiral. After the death of Nelson at the Battle of Trafalgar, Lord Collingwood took command, and though naval experts think that the action of Collingwood greatly minimised the number of prizes which would have resulted from the victory, Lord Collingwood received for an augmentation a chief wavy gules, thereon the lion of England, navally crowned, with the word "Trafalgar" above the lion. He also received an additional crest, namely, the stern of his ship, the Royal Sovereign, between a wreath of oak on the one side and a wreath of laurel on the other. The heroic story of the famous fight between the Shannon and the Chesapeake has been often told. Captain Broke sent in a challenge to the Chesapeake to come out and fight him, and, though a banquet was prepared by the Mayor of Boston for that evening "to meet the English officers," Captain Broke defeated the Chesapeake in an engagement which only lasted a very short time. He was granted an additional crest, namely, an arm holding a trident and issuing from a naval crown, together with the motto, "Sævumque tridentem servamus." General Ross fought and won the Battle of Bladensburg, and took the city of Washington, dying a few days afterwards. The story is that the family were offered their choice of a baronetcy or an augmentation, and they chose the latter. The augmentation (Plate II. ), which was specially granted with permission for it to be placed upon the monument to the memory of General Ross, consists of the arm holding the flag of the United States with a broken flag-staff which will be seen both on the shield itself, and as an additional crest. The shield also shows the gold cross for previous services at Corunna and in the Peninsula. 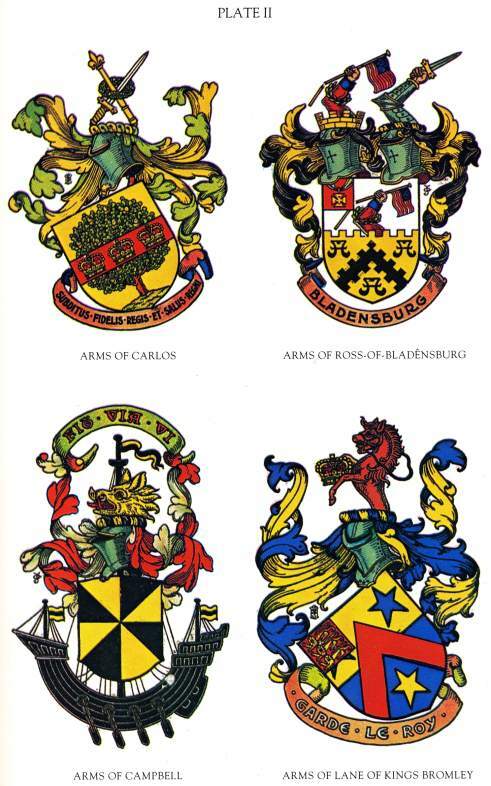 The family were also given the surname of "Ross-of-Bladensburg." The capture of Curaçoa by Admiral Sir Charles Brisbane, K.C.B., is commemorated by the representation of his ship passing between the two Dutch forts; and by the additional crest of an arm in a naval officer's uniform grasping a cutlass. Admiral Sir Robert Otway, for his distinguished services, was granted: "On a chief azure an anchor between two branches of oak or, and on the dexter side a demi-Neptune and on the sinister a mermaid proper," to add to his shield. Admiral Sir George Pocock, who captured Havannah, was given for an augmentation: "On a chief wavy azure a sea-horse" (to typify his naval career), between two Eastern crowns (to typify his services in the East Indies), with the word "Havanna," the scene of his greatest victory. Sir Edward Pellew, who was created Viscount Exmouth for bombarding and destroying the fort and arsenal of Algiers, was given upon a chief a representation of that fort, with an English man-of-war in front of it, to add to his arms. It is interesting to note that one of his supporters, though not a part of his augmentation, represents a Christian slave, in memory of those in captivity at Algiers when he captured the city. There were several augmentations won at the Battle of Waterloo, and the Waterloo medal figures upon many coats of arms of Waterloo officers. Colonel Alexander Clark-Kennedy, with his own hand, captured the French Eagle of the 105th French Regiment. For this he bears a representation of it and a sword crossed upon a chief over his arms, and his crest of augmentation is a demi-dragoon holding the same flag. Of the multitude of honours which were showered upon the Duke of Wellington, not the least was his augmentation. This was a smaller shield to be superimposed upon his own, and charged with those crosses of St. George, St. Andrew, and St. Patrick, which we term "the Union Jack." Sir Edward Kerrison, who distinguished himself so greatly in the Peninsula and at Waterloo, was granted a sword with a wreath of laurel and representations of his medals for Orthes and Waterloo, and, for an additional crest, an arm in armour holding a banner inscribed "Peninsula." Sir Thomas Munro, who will be long remembered as the Governor of Madras, was rewarded for his capture of Badamy by a representation of that hill-fort in India. The augmentation of Lord Keane is very similar, being a representation of the Fortress of Ghuznee in Afghanistan, which he captured. Other instances of a similar character are to be found in the arms of Cockburn-Campbell and Hamilton-Grace. The arms of Lord Gough are most remarkable, inasmuch as they show no less than two distinct and different augmentations both earned by the same man. In 1816, for his services in the Peninsula, he received a representation of the Spanish Order of Charles III., and on a chief the representation of the Fortress of Tarifa, with the crest of the arm holding the colours of his own regiment, the 87th, and a French eagle reversed and depressed. After his victories in the East, particularly at Goojerat, and for the subjugation and annexation of the Punjab, he was granted, in 1843, an additional quartering to add to his shield. This has the Lion of England holding up the Union Jack below the words "China" and "India." The third crest, which was then granted to him, shows a similar lion holding the Union Jack and a Chinese flag. Sir George Pollock, "of the Khyber Pass," Bart., earned everlasting fame for himself in the first Afghan War, by forcing the Khyber Pass and by the capture of Cabul. For this he was given an Eastern crown and the word "Khyber" on a chief as well as three cannon upon a canton, and at the same time he was granted an additional crest--a lion holding an Afghan banner with the staff thereof broken. With him it seemed as if the practice of granting augmentations for military services had ceased. Lord Roberts has none, neither has Lord Wolseley. But recently the old practice was reverted to in favour of Lord Kitchener. His family arms were: "Azure, a chevron cottised between three bustards," and in the centre chief point a bezant; with a stag's head for a crest; but for "smashing the Khalifa" he has been given the Union Jack and the Egyptian flag with the staves encircled by a coronet bearing the word "Khartoum," all on a pile superimposed over his family arms. He also received a second crest of an elephant's head holding a sword in its trunk issuing from a mural crown. At the conclusion of the South African War a second augmentation was granted to him, this taking the form of a chief. Two other very interesting instances of augmentation of arms are worthy of mention. Sir Ralph Abercromby, after a distinguished career, fought and won the Battle of Aboukir Bay, only to die a few days later on board H.M.S. Foudroyant of his wounds received in the battle. But long before he had fought and conquered the French at Valenciennes, and in 1795 had been made a Knight of the Bath. The arms which are upon his Stall plate in Westminster Abbey include his augmentation, which is an arm in armour encircled by a wreath of laurel supporting the French Standard. Sir William Hoste gained the celebrated victory over the French fleet off the Island of Lissa in 1811, and the augmentation which was granted was a representation of his gold medal hanging from a naval crown, and an additional crest, an arm holding a flag inscribed with the word "Cattaro," the scene of another of his victories. Peace has its victories no less than war, but there is generally very much less fuss made about them. Consequently, the augmentations to commemorate entirely pacific actions are considerably fewer in number. The Speke augmentation has been elsewhere referred to, and reference may be made to the Ross augmentation to commemorate the Arctic exploits of Sir John Ross. It is a very common idea that arms were formerly to be obtained by conquest in battle. Like many other heraldic ideas, there is a certain amount of truth in the idea, from which very erroneous generalisations have been made. The old legend as to the acquisition of the plume of ostrich feathers by the Black Prince no doubt largely accounts for the idea. That legend, as has been already shown, lacks foundation. Territorial or sovereign arms doubtless would be subject to conquest, but I do not believe that because in battle or in a tournament à outrance one person defeated another, he therefore became entitled to assume, of his own motion, the arms of the man he had vanquished. The proposition is too absurd. But there is no doubt that in some number of historic cases his Sovereign has subsequently conferred upon the victor an augmentation which has closely approximated to the arms of his victim. Such cases occur in the arms of the Clerkes, Barts., of Hitcham, Bucks, who bear: "On a sinister canton azure, a demiram salient of the first, and in chief two fleurs-de-lis or, debruised by a baton," to commemorate the action of Sir John Clerke of Weston, who captured Louis D'Orleans, Duke of Longueville, at Borny, near Terouenne, 5 Henry VII. The augmentation conferred upon the Duke of Norfolk at the battle of Flodden has been already referred to, but the family of Lloyd of Stockton, co. Salop, carry a remarkable augmentation, inasmuch as they are permitted to bear the arms of Sir John Oldcastle, Lord Cobham, to commemorate his recapture by their ancestor after Lord Cobham's escape from the Tower. FIG. 773.--Arms of Robert de Vere, Duke of Ireland and Earl of Oxford: Quarterly, 1 and 4 (of augmentation), azure, three crowns or, within a bordure argent; 2and 3, quarterly gules and or, in the first quarter a mullet argent. Augmentations which have no other basis than mere favour of kings, or consanguinity to the Royal Family, are not uncommon. Richard II., who himself adopted the arms of St. Edward the Confessor, bestowed the right to bear them also upon Thomas Mowbray, Duke of Norfolk (Fig. 675). No difference was added to them in his case, which is the more remarkable as they were borne by the Duke impaled with the arms of England. In 1397 the King conferred the same arms upon John de Holland, Duke of Exeter, differenced by a label argent, and upon Thomas de Holland, Duke of Surrey, within a bordure ermine. Richard II. seems to have been inclined to the granting of augmentations, for in 1386, when he created the Earl of Oxford (Robert de Vere) Duke of Ireland, he granted him as an augmentation the arms of Ireland ("Azure, three crowns or") within a bordure argent (Fig. 773). The Manners family, who were of Royal descent, but who, not being descended from an heiress, had no right to quarter the Royal Arms, received the grant of a chief "quarterly azure and gules, in the first and fourth quarters two fleurs-de-lis, and in the second and third a lion passant guardant or." This precedent might well be followed at the present day in the case of the daughters of the Duke and Duchess of Fife. It was adopted in the case of Queen Victoria Eugenie of Spain. The Waller family, of Groombridge, co. Kent, one of whom, Richard Waller, captured Charles, Duke of Orleans, at the battle of Agincourt, received as an augmentation the right to suspend from the crest (" On a mount a walnut-tree proper ") an escutcheon of the arms of that Prince, viz. : "Azure, three fleurs-de-lis or, a label of three points argent." Lord Polwarth bears one of the few augmentations granted by William III., viz. : "An inescutcheon azure charged with an orange ensigned with an Imperial crown all proper," whilst the titular King James III. and VIII. granted to John Græme, Earl of Alford, a coat of augmentation, viz. : "The Royal Arms of Scotland on the field and cross of St. Andrew counterchanged," the date of the grant being 20th January 1734. Sir John Keith, Earl of Kintore, Knight Marischal of Scotland, saved the regalia of Scotland from falling into the hands of Cromwell, and in return the Keith arms (now quartered by Lord Kintore) were augmented with "an inescutcheon gules, a sword in bend sinister surmounted by a sceptre in bend dexter, in chief an Imperial crown, the whole within an orle of eight thistles." The well-known augmentation of the Seymour family: "Or, on a pile gules, between six fleurs-de-lis azure," is borne to commemorate the marriage of Jane Seymour to Henry VIII., who granted augmentations to all his wives except Catharine of Aragon and Anne of Cleves. The Seymour family is, however, the only one in which the use of the augmentation has been continued. The same practice was followed by granting the arms of England to the Consort of the Princess Caroline and to the late Prince Consort. See page 499. FIG. 774.--Device from the chief of the "Prussian Sword Nobility." The frequent grant of the Royal tressure in Scotland, probably usually as an augmentation, has been already referred to. King Charles I. granted to the Earl of Kinnoull as a quartering of augmentation: "Azure, a unicorn salient argent, armed, maned, and unguled or, within a bordure of the last charged with thistles of Scotland and roses gules of England dimidiated." The well-known augmentation of the Medicis family, viz. : "A roundle azure, charged with three fleurs-de-lis or," was granted by Louis XII. to Pietro de Medicis. The Prussian Officers, ennobled on the 18th of January 1896, the twentyfifth anniversary of the foundation of the new German Empire, bear as a device a chief purpure, and thereupon the Prussian sceptre and a sword in saltire interlaced by two oak-branches vert (Fig. 774). The late Right Hon. Sir Thomas Thornton, G.C.B., received a Royal Licence to accept the Portuguese title of Conde de Cassilhas and an augmentation. This was an inescutcheon (ensigned by his coronet as a Conde) "or, thereon an arm embowed vested azure, the cuff gold, the hand supporting a flagstaff there from flowing the Royal Standard of Portugal." The same device issuing from his coronet was also granted to him as a crest of augmentation. Sir Woodbine Parish, K.C.H., by legislative act of the Argentine Republic received in 1839 a grant of the arms of that country, which was subsequently incorporated in the arms granted to him and registered in the Heralds' College in this country. He had been Consul-General and Charge d'Affaires at Buenos Ayres, 1823-1832; he was appointed in 1824 Plenipotentiary, and concluded the first treaty by which the Argentine Republic was formally recognised. Reference has been already made (page 420) to the frequent grant of supporters as augmentations, and perhaps mention should also be made of the inescutcheons for the Dukedom of Aubigny, borne by the Duke of Richmond and Gordon, and for the Duchy of Chatelherault, borne by the Duke of Abercorn. Possibly these should more properly be ranked as territorial arms and not as augmentations. A similar coat is the inescutcheon borne by the Earl of Mar and Kellie for his Earldom of Kellie. This, however, is stated by Woodward to be an augmentation granted by James VI. to Sir Thomas Erskine, one of several granted by that King to commemorate the frustration of the Gowrie Plot in 1600. The Marquess of Westminster, for some utterly inexplicable reason, was granted as an augmentation the right to bear the arms of the city of Westminster in the first quarter of his arms. Those who have rendered very great personal service to the Crown have been sometimes so favoured. The Halford and Gull (see page 250) augmentations commemorate medical services to the Royal Family, and augmentations have been conferred upon Sir Frederick Treves and Sir Francis Laking in connection with His Majesty's illness at the time of the Coronation. The badges of Ulster and Nova Scotia borne as such upon their shields by Baronets are, of course, augmentations. Two cases are known of augmentations to the arms of towns. The arms of Derry were augmented by the arms of the city of London in chief, when, after its fearful siege, the name of Derry was changed to Londonderry to commemorate the help given by the city of London. The arms of the city of Hereford had an azure bordure semé of saltires couped argent added to its arms after it had successfully withstood its Scottish siege, and this, by the way, is a striking example of colour upon colour, the field of the coat being gules. There are many grants in the later part of the eighteenth and the beginning of the nineteenth centuries recorded in Lyon Register which at first sight appear to be augmentations. Perhaps they are rightly so termed, but as the additions usually appear to be granted by the Lyon without specific Royal Warrants, they are hardly equivalent to the English ones issued during the same period. Many ordinary grants made in England which have borne direct reference to particular achievements of the grantee have been(by the grantees and their descendants) wrongly termed augmentations. A rough and ready (though not a certain) test is to imagine the coat if the augmentation be removed, and see whether it remains a properly balanced design. Few of such coats will survive the test. The additions made to a coat to make it a different design, when a new grant is founded upon arms improperly used thereto fore, are not augmentations, although spoken departures from the truth on this detail are by no means rare.